HOW MANY TREES DID YOUR FAMILY CHOP DOWN LAST YEAR? Yes, the average person owes a debt of 100 trees to the world just from the amount of bathroom tissue, paper and disposable products that we use in a lifetime. It has been estimated that humans have cut down 3 trillion trees since the very beginning when man taught himself how to make a fire. To make up for this extreme number, every person alive today would have to plant 400 trees in a lifetime. Trees are an essential resource to mankind. We use trees for so many things including fuel, tools, food and shelter. Many products that are made from trees are put to good use. There are others that are so extremely wasteful that we must make a transition to the sustainable alternative. An example is the toilet paper roll. Cutting down trees to make a product that you flush down the toilet is not resourceful. We all have our preferences when it comes to toilet paper. Women tend to want the softest toilet paper roll for the family, but what you don’t know is that the whiter and softer a tissue paper is, the more virgin wood and full grown trees have been destroyed to make it. Making a ton of this virgin paper uses an average of 20 trees. Americans take 27% of the wood products from trees harvested worldwide. The American consumption of tree products translates to 3 trees per person. All this demand for toilet paper and other tree product means that trees are cut at a faster rate than they can be planted. This has led to the global problem of deforestation. It is estimated that 13 million hectares of forest are being lost every year. That is the size of Panama. The UN estimates that if this rate continues, there will be no forests in less than a hundred years. Deforestation is causing an immense chain of troubles in the world. Foremost is the change of climate. Trees act as huge receptors where the world’s carbon can sink in because trees take in carbon to make their nutrients. Fewer trees and increased carbon emissions have led to the accumulation of carbon in the atmosphere making the world a hotter place and as scientists have termed it global warming or climate change. Climate change has led to prolonged droughts in places like Africa, and severe storms in places like Asia and North America. Problems that have resulted include drought, famine, displacement of people and death. What action can we take? We all have to play a part in stopping and reversing the disaster of deforestation. One way is by using environmentally friendly bathroom tissue. WHOLEROLL is a startup with a global mission to transition the population from using virgin pulp and encourage the consumer to begin using their sustainable alternative. We need more green toilet paper. This startup has committed to planting a tree for every subscription box purchased, and you will get the WHOLEROLL Box shipped directly to your door. You will also get a free reusable tote with each delivery. WHOLEROLL is launching on Kickstarter in April 2017. 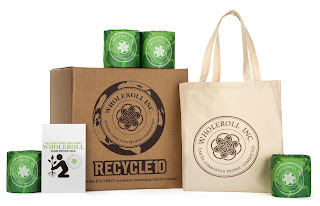 You are invited to sign up at www.wholeroll.com to get more details and updates on this sustainable product that will be taken around the globe. Trees are a vital source of life for all living creatures. Destroying forests is not the answer. We must be responsible for the environment. The trees are the lungs of the earth.